What Are Food Enzymes & How The Enzymes Benefit Us? In this article, I will try to explain what I know about food enzymes after doing my research and reading on the internet. Enzymes refer to compounds that act as catalysts in a biochemical process. A catalyst is something that speeds up a biochemical reaction. In this article, my focus will be on food enzymes. Food enzymes are mostly found in raw foods. However, foods that are wet-cooked at around 47.78 degree Celsius or higher, or dry-cooked at around 65.56 degree Celsius, lose the necessary enzymes that are useful to your health. 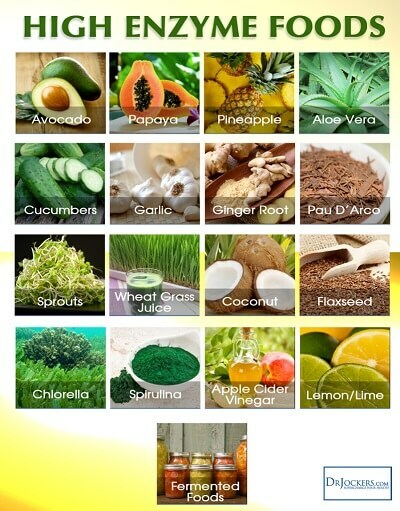 Food enzymes not only assist in the digestion process, they offer a host of other benefits as well. A simple rule is that if you can eat wet or dry food at the highest temperature (in the process of cooking) while not burning yourself, then the food enzymes are still active and could be beneficial to your health. Some important enzymes include the following. Amylase: Responsible for digesting carbohydrates. Also, higher doses of Amylase can help strengthen the body against various allergic reactions. Protease: Responsible for the digesting protein. Higher dosage of protease will help remove the excess protein from the circulatory system. Protease can even help combat colds, flus and tumours caused by cancer. This is because tumours, in particular, are usually covered by up to 15 times more fibrin than normal cells. Fibrin is an insoluble protein formed from fibrinogen during the clotting of blood. It forms a fibrous mesh that impedes the flow of blood. By eating away at the fibrin layers, protease helps the immune system attack the cancer cells. Lipase: An enzyme that is responsible for digesting fat. Higher dosages of lipase can help clear the blood stream of any fat molecules. This, in turn, helps reduce blood pressure and even helps with weight control. Cellulase: An enzyme that is responsible for digesting fibre. Soluble fibre works by binding itself to excess cholesterol and other toxins and then removes them from the body. Cellulase enhances this function by breaking down soluble fibre, which makes it more efficient. Also, cellulase can bind itself to heavy metals and toxins and help clear them from the bloodstream. Maltase: An enzyme that is responsible for processing complex sugar that is found in grain and malt products into glucose. Sucrase: An enzyme that is responsible for digesting the sugars that are found in various food products. Bromelain: An enzyme that helps digests protein. Lactase: An enzyme that is responsible for digesting lactose that is found in various dairy products. Even though all raw foods contain enzymes, some foods, in particular, have higher concentrations of enzymes than others do. 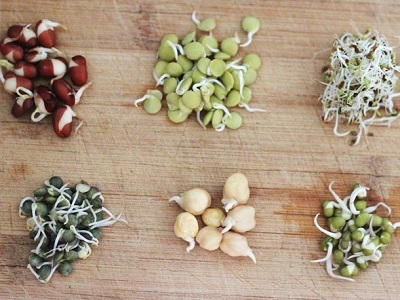 For example, sprouted seeds, grains, and legumes are the most powerful enzyme-rich food available. However, if you have an enzyme deficiency, it is better to take enzyme supplements as opposed to more raw food. The lack of digestive enzymes can lead to various food allergies. Some of the symptoms include bloating, belching, bowel-disorders, gas, abdominal cramps and heartburn. Unfortunately, processed foods are not the only thing in the way of maintaining healthy enzyme levels. Recent studies show that the body’s ability to produce enzymes diminishes when we grow older. Therefore, it is important to take enzyme supplements to maintain a healthy body. However, any supplements must be taken after consultation with your doctor. Keep in mind that enzymes can intensify the reactions of certain drugs, so always check with your doctor before taking enzyme supplements while on other medication. Taking food enzyme supplements can serve a wide variety of purposes, including improving blood sugar levels and reducing uncomfortable gas caused by certain foods. For my family, me, my husband and 2 of our daughters are taking Zencoso as our food enzymes supplement. We’ve started taking Zencoso back in May 2018 and the results have been very encouraging. One of the benefits we’ve experienced is with my eldest daughter’s appetite. After taking the food enzyme supplement, she is now eating twice the food portion during dinner! That is wonderful because my eldest daughter has always been under weight. You can read more about my family experience with food enzyme supplementation here. Here’s a tip: In addition to taking food enzyme supplements, make sure to eat a diet rich in fresh fruits and vegetables. Nuts and seeds are also good choices to ensure you get the naturally occurring food enzymes you need to thrive.